as a special guest designer today. Juliana grew up in a creative household loving art, design, and making things with her hands. She gives all the credit to her creative mother who loved to paint, sew and draw. Her mother also photographed her daily life and kept all of these photos stored and displayed in photo albums. Nearly 15 years ago she found her true passion in paper crafting and scrapbooking thanks to the combination of being exposed to these creative activities and photographic documentation of her daily life. Since 2008 she has been creating and sharing paper crafting projects on her blog (http://www.17turtles.com/). She has been a project designer in the paper craft/scrapbook industry since 2007. She has been fortunate to work for many top manufacturers including: BoBunny, Bella Blvd, Elle's Studio, SRM Stickers, Provocraft, Pebbles, and Jillibean Soup. Her projects have been published in a variety of magazines and idea books and she has had projects displayed at the Craft and Hobby Association Trade Show. Juliana is married to Danny, her best friend and the love of her life. She is also mom to a Golden Retriever named Lincoln and an American Paint Horse named Woody. She has a fondness for coffee, Mexican food, turtles and antiquing. In her spare time she enjoys running, working out, cooking, and reading science and historical fiction. Hi Leaky Shed Studio Fans! I'm Juliana from 17turtles and I'm pleased to be here today to share a scrapbook page I created using one of my favorite Leaky Shed Studio Chipboard pieces. I don't really love the snow, but I love snowflakes. With that being said, the Snowflake Border Large was the perfect piece for embellishing this layout of our sweet Milo playing in the snow last year. I inked the chipboard with Versamark Watermark Ink. To achieve a little bit of dimension, I sprinkled it with white embossing powder, while the ink was still wet, and heat embossed it with a heat gun. The original Snowflake Border is 11 inches long, however, it was too large for my design. My solution? I trimmed the border by cutting off one of the snowflakes. This made it the perfect size to fit in the center of my design and it left me with an extra snowflake to use on another project. It was a pleasure to create and share this layout with you today. 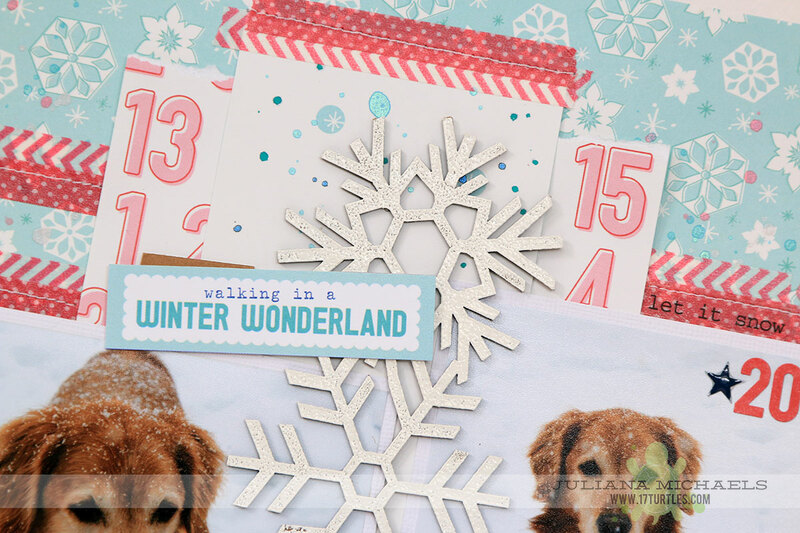 Do you enjoy scrapbooking your winter activities? Make sure to check out Leaky Shed Studio for all your winter shaped chipboard needs! to view more of her gorgeous work! Love Juliana's work! This is a beautiful page!! Wow, what a gorgeous layout! I am such a huge fan of Juliana's! LOVE her use of the snowflake border! Looks amazing embossed, and love the placement down the center of the layout. SO eye catching!